n this tutorial we show you how to reset an iPhone or iPad to factory settings, which is essential if you need to wipe the data from a device because you're selling it. It can also be effective if your iDevice has frozen or is suffering from problems you can't identify. Modern electronic devices are very complicated, and can get themselves into a bit of a confused state from time to time. Resetting can clear out random problems that cause the device to get stuck in a loop, appear sluggish or otherwise impair their performance. It's not a guarantee, but you'd be surprised how often it works. If you want to erase your device completely, then there are a few steps to take. First of all make sure you have a backup ready, and we're about to show you how to do so. 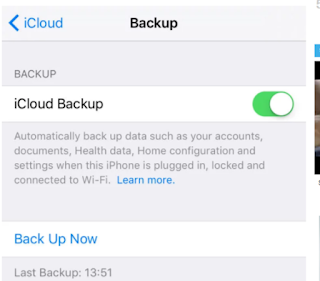 You can use either iCloud or iTunes to back up your iOS device. For iCloud go to Settings > iCloud > Backup and ensure that the feature is enabled. To see when the last backup was run look under the Back Up Now option where the date and time should be displayed. If you haven't done a backup before you can tap the Back Up Now button and follow the instructions. 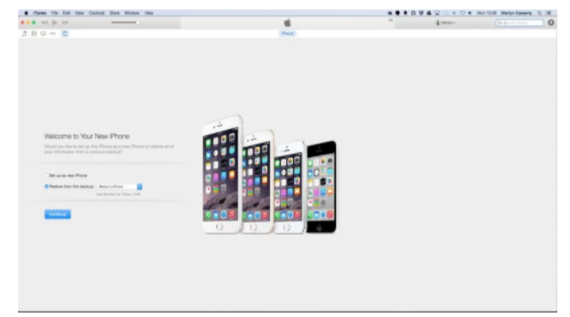 For more detailed advice on this process, read our tutorial showing how to back up an iPhone. To use iTunes you'll need to plug your iPhone or iPad into your PC or Mac using the charging cable. Click on the iPhone or iPad icon in the top left corner of iTunes, under the Play button. Once you're confident that you've backed up your iPad or iPhone, you're ready to perform a factory reset. This will completely wipe your device, which is why having a backup beforehand is so important. A factory reset can help resolve issues with your iPhone or iPad if it's crashing or freezing, but it is also what you'll want to do if you need to wipe your iPhone or iPad before selling it, or passing it on to a family member or friend. When selling an iPhone or iPad, it's absolutely vital that you delete all the sensitive data stored on it. If not, an unscrupulous buyer could gain access to your social media profiles, your financial information and even your personal photos and videos, enabling them to browse through your private moments or steal your identity. Luckily it's very easy to completely wipe an iPad or iPhone. Simply follow the steps in this tutorial and your data security will be assured. What if your iPhone or iPad isn't backed up? To check when your iPhone last backed up, go to Settings > iCloud > Backup and look at the date and time of the last back up. It will have happened the last time you plugged your iPhone in to charge and had Wi-Fi access available. It happens automatically. Is it possible to rescue data from a wiped iPhone or iPad? Almost certainly not, which is why you need to be sure before resetting it. That's the quick method, but if you just want to free up some space a full wipe clearly isn't the best option. 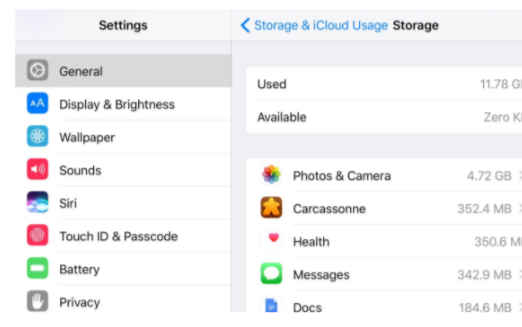 To identify the biggest culprits taking up your storage space, go to Settings > General > Storage & iCloud Usage, then under STORAGE tap Manage Storage. iOS will tell you firstly how much space you're using and how much is available, and will then list the apps taking up the most space. Remember that these listings include associated documents and files as well as the app itself, so Photos and Music are likely to be up near the top. Instead of deleting the app (which you wouldn't be able to do anyway, with Apple's preinstalled apps) you could go into the app in question and clear out some old photos or songs, for example. If having erased the content of the phone you intend to keep using it, you can restore the content to your phone from your backup. 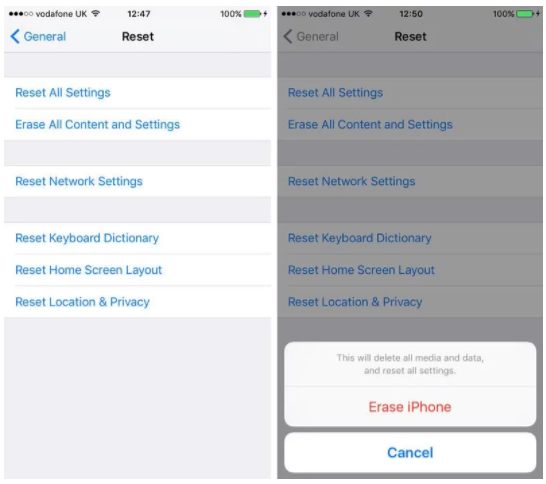 With the factory reset completed you'll need to go through the setup of your iPhone again from the beginning; entering your details, WiFi password and a few other things until you reach the page where you're asked how you want to 'Set Up iPhone'. You have the three options - Set Up as a New iPhone, Restore from iCloud Backup or Restore from iTunes backup - so select the iCloud option and you'll be prompted to enter your iCloud account details. Once you've done this, and agreed to the terms and conditions, your iPhone will begin restoring all of your data.